A permanent exhibition for the Egyptian artist Inji Aflatoun will open this Thursday at the Amir Taz Palace. The exhibition will display 88 of her works as well as a rare collection of her personal items. Inji Aflatoun (1924-1989) is considered one of the important Egyptian visual artists and is known as the bourgeoisie-born socialist artist. She was mentored by artist Kamal El-Telmisany, who not only taught her art, but also history, philosophy, music, literature sociology and poetry. 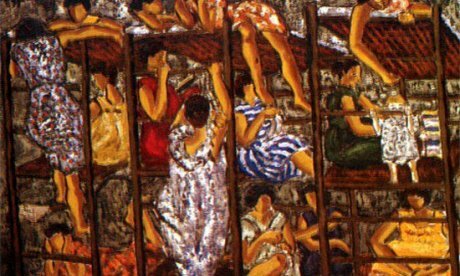 Aflatoun is known for her political activism that is manifested in her art, as her paintings portray the struggle of the working class and the lives of peasants. She has also portrayed life in prison - which she was able to do from experience. She was jailed for four years; between 1959 - 1963. Three books are under her name, and she has participated in many local and international exhibitions. The exhibition will open at 9:30 pm at Amir Taz Palace located at the intersection between Saliba Street and Suyufiyya Street in Old Cairo.